Notes: "Sewall, Day & Co., manufacturers, Boston, Mass., U.S.A."
Notes: Exhibit titles: Mackellar, Smiths & Jordan, Phila., Pa., Exhibit #459; Sewall, Day, & Co., Boston, Mass., Exhibit # 982a; Gutta-Percha & Rubber Manufacturing Co., New York , NY, Exhibit # 784a, Machinery Hall, Bldg. #2. 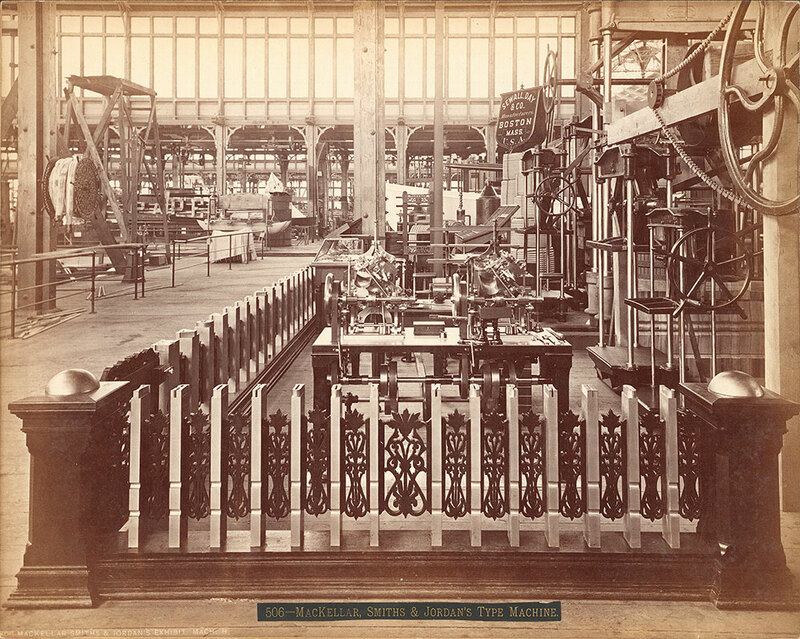 Notes: The display surrounded by a fence and showing a typesetting machine and other machinery in the foreground with the aisle to the left and other displays in the background. Gutta-Percha & Rubber Manufacturing Co.